We started our trip by driving to Gruene, Texas (pronounced Green for anyone not from Texas reading this). Gruene is a little German settlement, technically in New Braunfels, along the Guadalupe River in what is known as the Texas Hill Country. 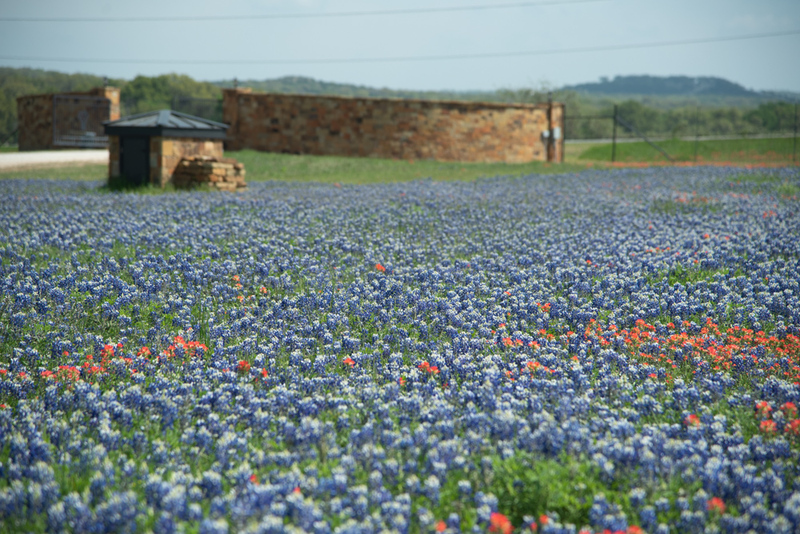 One goal in choosing the Hill Country was so we could take advantage of seeing the spring wildflowers in bloom - and we were not disappointed! We have also visited Gruene a couple of times in the past and knew it would be a fun destination. We were not disappointed! I must say that my diet somehow got slightly misaligned on our travels. When you stay at a location that includes breakfast and they serve you an amazing feast, it’s hard to resist. And it was served buffet style with the chef standing right there, and I didn’t want to offend him by not trying everything! Then there were so many great places to eat. Dinner our first evening was at the Gristmill - a place where if you are eating in Gruene, we were told you must eat here. Lunch the next day was at Gruene River Grill. 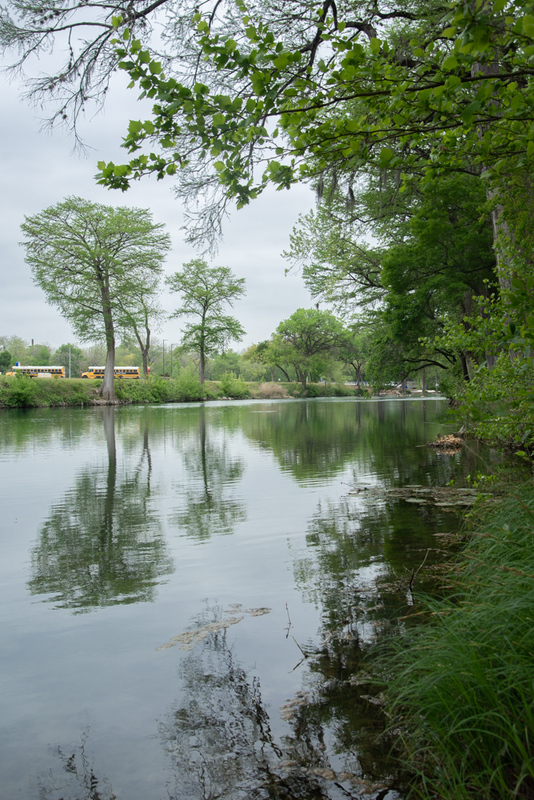 At both of these venues we had tables overlooking the Guadalupe River. Just beautiful and really peaceful! A great place to unwind! On Thursday evening, for our anniversary, we dined at The Gruene Door. It was a very lovely evening, great ambiance, as well as great food. Both evenings, we stopped in at Gruene Hall - known as Texas’ oldest dance hall - circa 1878. Wednesday evening, we listened to a blues band. They were quite good, although unfortunately for them, the crowd was a little sparse but afforded us great seats. The next night, we arrived late, after our nice dinner, and it was a country band, and they drew quite a crowd and folks were dancing and since we could barely see the band for all the people standing, we had a good view of the dance floor, so we got in some good people watching while we listened to the music. Friday, after another great breakfast, we drove back north towards Johnson City where we stopped at the Wildseed Farm. I thoroughly enjoyed walking through the gardens, taking pictures along the way. Randy enjoyed the gardens from a shady bench! That evening we tried out a B&B in Marble Falls and enjoyed a brief stroll through their downtown historic district. We ended with a great meal at Bill’s Hamburgers - a really, really great hamburger! It was an all around nice evening, met some local folks at the next table and learned more about the area, enjoyed nice temps outside, low humidity and another good meal. As we were driving home today along the back roads (purposefully avoiding I 35 - although for those of you who have traveled I 35 in the past 10 years, you know that it has been undergoing road repairs for about that long, and I’m happy to report that there are 3 lanes open in each direction through Waco and Temple!) 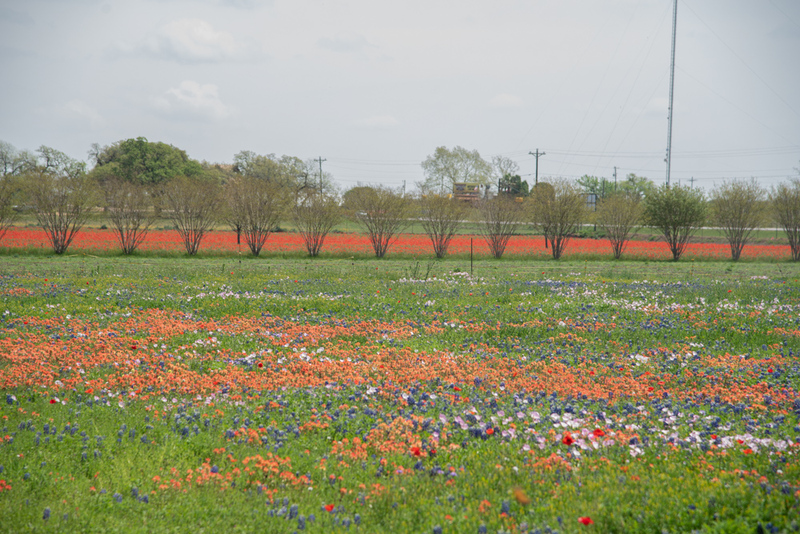 Despite that, we still thought it would be more enjoyable to drive back on lesser roads and enjoy the Texas countryside. 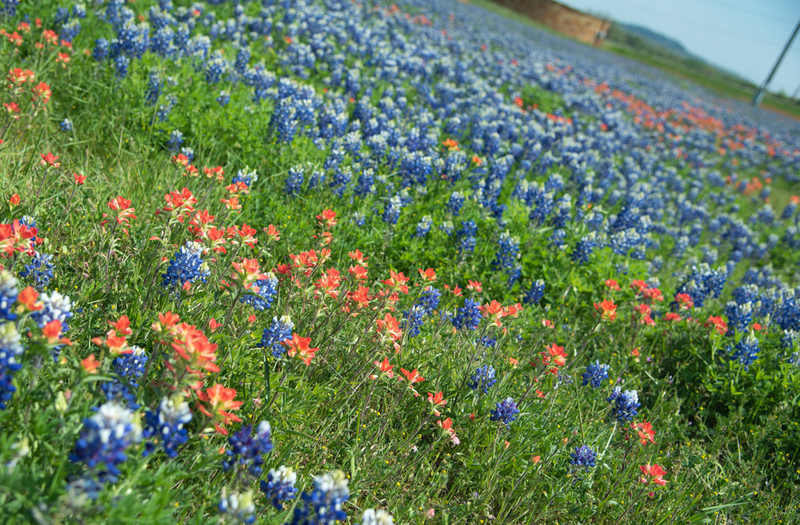 As we left Marble Falls this morning for our planned drive on some wildflower trails, we experienced a bit of a downpour and, while most of the time we could see the bluebonnets and other wildflowers through the windows of the truck, we were not able to get out and really enjoy or photograph them. The rain eventually cleared and we were able to truly appreciate the various shades of green that springtime brings, outlined by the dark tree trunks as well as lots of blue, red, and yellow flowers along the roads. Another view I enjoyed were all the cattle, horses and goats in pastures along the roads. I know other states have cows in pastures, but there is just something about seeing all the cows grazing in Texas pastures that just makes me feel at home! And, I love seeing all the Texas flags flying! We lived in Louisiana for 11 years, and I can tell you, I do not remember seeing the state flag flown there anywhere near as frequently as you see it in Texas! So, as we drove through the Texas countryside in our Ford pickup truck, enjoying the views and listening to a mix of songs on my phone, we were reminded of the many things we have to be thankful for and that we were glad to have had the chance to get out of town for a few days and spend some quality time together! Click on the image below and it will advance to the next and enjoy some of our travels. 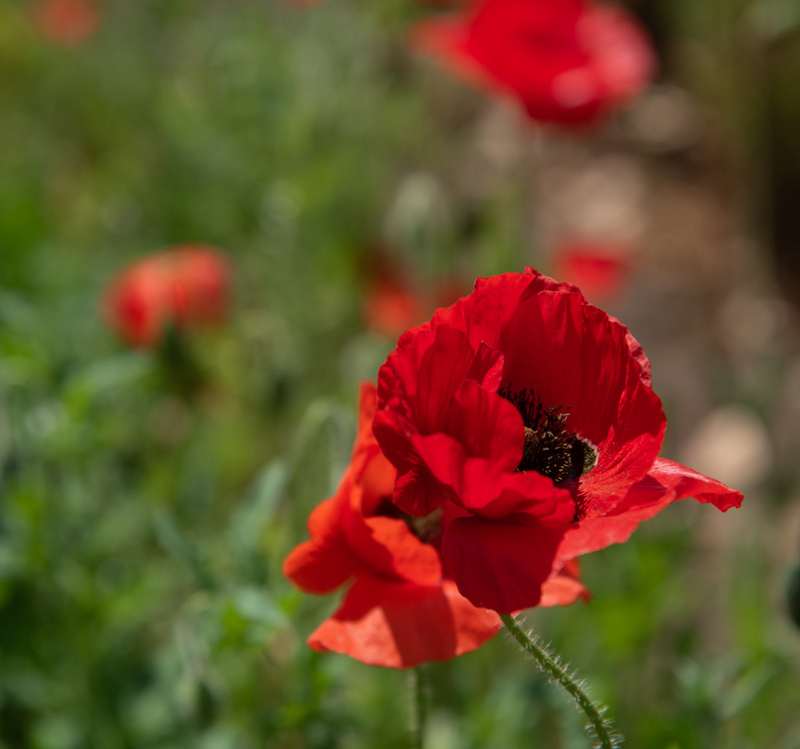 By the way, I love Red Poppies! !